A waste paper bin isn’t something you would naturally put much thought into buying. For the most part, it is a necessity in any room of the home and it’s likely to be tucked away in the corner, barely visible anyway. But that doesn’t have to be the case. If you’ve spent a lot of time designing and decorating your dream home, why cut corners by having mismatched accessories dotted about? Rather than picking up something cheap that simply does the job, you could invest in a better quality bin that also complements your overall décor. The bin does also need to be functional, so where you plan to place it will have an impact on the style you choose. Firstly, something that’s not too small means emptying less frequently (because no one likes taking the bins out, ever!) and the material – metal, wicker, plastic – may determine whether it is suitable for any other waste besides actual paper. We’ve picked out the top 5 bins for home offices, living room and bedrooms that will add a touch of style to your home, as well as provide a welcome home for all your trash. This classic rattan basket is the perfect waste paper basket for homes with a shabby chic or rustic décor. 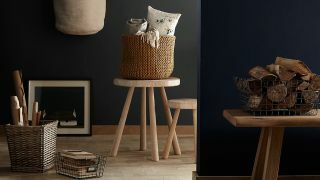 The strong rattan basket is sturdy but lightweight, making it a useful bin for any room in the house. Reviewers love the quality look of this bin and it gets rave reviews for its versatility and the fact that it blends in nicely into pretty much any room. Part of the Croft Collection at John Lewis, this bin can be teamed with rugs, curtains and furniture all from the same design range. The off-white colour does mean you need to be careful about what you dispose of as it could easily stain the basket, so food debris should be avoided. Designer homeware retailer Made have teamed industrial chic with the ever-popular copper trend to bring us a fashionable bin (yes that's a thing!) with its Bendt wire storage range. With a bold copper plated finish, this is a waste paper bin for the trend-conscious among us. The collection also features matching storage accessories for bedrooms and home offices including magazine racks, memo boards and wall units all in the same modern design. Putting a bag inside this bin would be a bit of a design 'no-no' so you'll probably want to make sure it is largely used for paper and larger bits of rubbish ad the wire design might leave some debris behind. If your home décor is more about luxury and sophistication, then this croc-effect black waste paper bin could blend in nicely. Aside from style, this bin is practical and a decent size for use in a bedroom or study. Customers love that this bin is subtle but luxurious, proving that the little finishing touches really do make all the difference. The perfect mixture of form and function for any room in the house where dark accessories are a welcome feature. Grey isn’t for everyone, but it's bang on trend at the moment and would suit a minimalist, shabby chic or rustic style room. What we love about this waste paper bin is that it is made entirely from recycled plastic, so if you’re trying to reduce your carbon footprint, this is the bin for you. Customers love how soft the outside is, and feel it adds a touch of warmth to a room. Given how tricky it can often be to find a nice, soft looking bin for rooms like the bedroom, John Lewis have found a great planet-friendly solution here that doesn't compromise on design. A simple one but a classic. If you simply need a waste paper bin that will reliably hold your waste until you’re ready to empty it and you're into the industrial trend, then this classic stainless steel bin is for you. It’s a classic design that doesn’t try too hard to be fancy and instead functions perfectly as, well, a bin. It looks like it would be heavy but customers find it incredibly lightweight, and the stainless steel looks surprisingly impressive in contemporary spaces. theradar is part of Future plc, an international media group and leading digital publisher. Visit our corporate site.